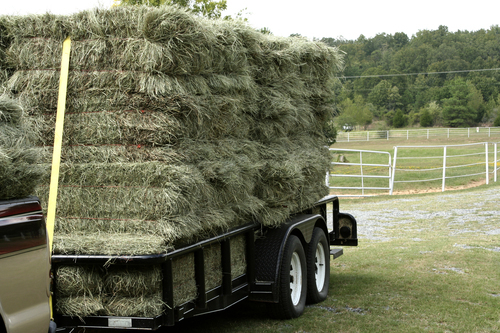 Making decisions about the best hay for your horse. Horses should consume 1.5 to 3 percent of their body weight in feed per day, and researchers and nutritionists recommend that 80% of that nutrition should come from grass and hay forages. Generally hay breaks down to approximately 30% carbohydrates and 50% fiber which is an excellent combination for horses at most stages of life and activity levels. A typical 1000 lb (454 kg) horse will consume 20 lbs (9 kg) of hay daily. 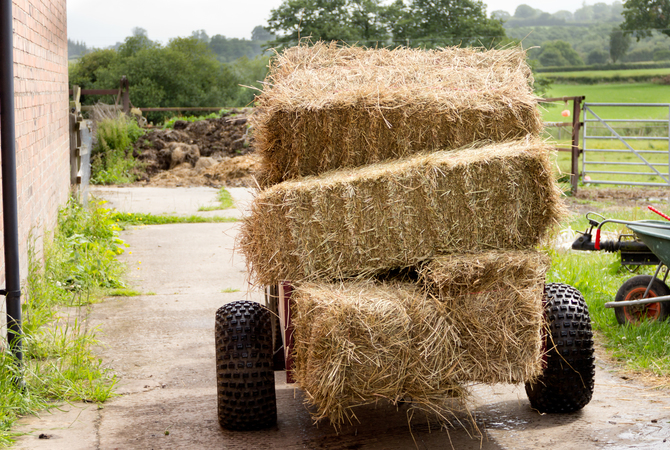 Hay, which is forage that has been harvested, dried and baled before being fed to horses, may be processed as round bales, square bales, cubes or pellets giving the horse owners choices as to which form is most convenient and economical for their feeding program. While baled hay is generally cheaper, the convenience of pellet or cubed forage is preferred by many horse owners. Depending on the location, climate and field conditions, hay fields are harvested several times a year. Plant maturity and species are reliable factors of hay quality and with a little research, you can determine which hay will best meet the needs of your horse. In general, legumes such as alfalfa and clover are higher in vitamins and protein than grass hays such as bermuda, blue orchard, and timothy. Cereal hay is hay made from grain crops that have not been harvested for grain, such as oat hay. Horses love legume hays of alfalfa and clover but a diet that consists completely of legume hays is not preferred. 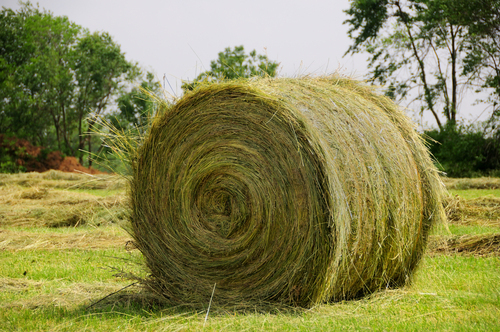 The leaves of all hays contain two-thirds of the total energy and the majority of the protein in the hay. Leaf loss, of course, decreases the nutritional value and quality of the hay. Alfalfa is by the the most commonly fed legume hay. In many cases, it contains twice the protein, three times the calcium and six times the magnesium of grass hay, and for some horses, is the only feed they need. One caveat in the feeding of alfalfa is that it can pose problems for the pregnant mare's fetus or growing foal. Depending on the quality of the alfalfa, mineral imbalances can lead to skeletal diseases in young horses. 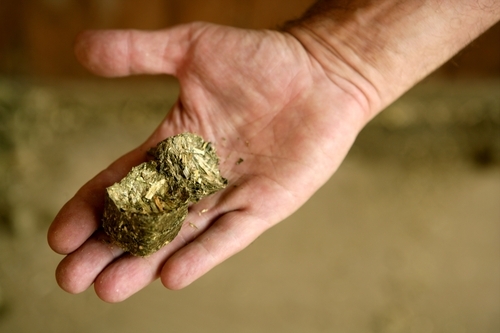 When feeding a pregnant or lactating mare alfalfa, you may need to add appropriate supplements to the mare's diet. Besides the general nutritional value of hay, the high fiber content is extremely important in the horse's diet. Fiber is essential for holding water in the digestive tract and aiding digestion. Fibrous feed such as hay that requires chewing also helps keep a horse from becoming bored, and the chewing creates added salivation which also helps in the digestive process. Your veterinarian can help you design a feeding program that is right for your horse based on the kinds of hay that are available in your particular locale. If you have any questions or qualms about the quality of the hay you are feeding your horse, you can take samples and have them analyzed by a forage testing lab which can give you a breakdown of the nutrients in each particular sample. Your local county extension office will be able to give you testing information.